Moore Industries designs and manufactures a variety of electronic interface instruments used for process control in industrial applications. Their products have been trusted for 50 years in industries such as chemical and petrochemical; power generation and transmission; petroleum extraction; refining and transport; pulp and paper; food and beverage; mining and metal refining; pharmaceuticals and biotechnology; industrial machinery and equipment; water and wastewater; and environmental and pollution monitoring. 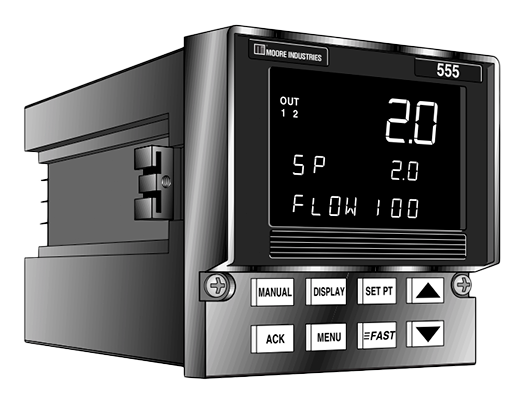 The Moore Industries Model 330R is an economical, universal-input (mA, mV, V, RTD, Thermocouple), multi-functional, microprocessor-based process monitor. It accepts signal input from a process instrument or temperature sensor and shows real-time process status on its large process display. Depending on selected options, it features single or dual alarm trip outputs, analog output for process controllers, and optional RS-485 digital transmission. For more information, see the Model 330R Process Monitor and Indicator Datasheet launch and contact us to start your order. 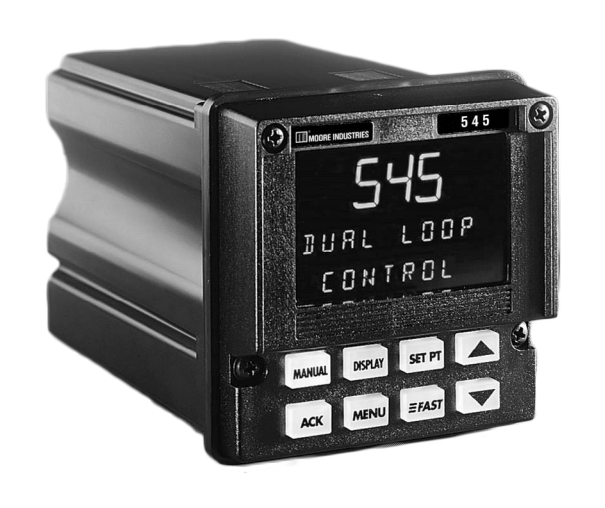 The Moore Industries Model 531 provides "bumpless", automatic PID control backup for critical loops controlled by PLC, DCS, or PC-based systems. With a simple operator interface and special parameters for control states, the Model 531 can be operated in various modes upon host transfer or failure. For more information, see the Model 531 Process Controller Backup Station Datasheet launch and contact us to start your order. The Moore Industries Model 532 provides comprehensive, reliable, manual backup of critical control loops upon sensing loss of a host (PLC, DCS, or PC) control signal. The device offers a variety of user friendly features including a clear, readable display, custom-programmable alarm messages, illuminated keys during use, and an intuitive menu. For more information, see the Model 532 Auto/Manual Backup Station Datasheet launch and contact us to start your order. The Moore Industries Model 535 is a universal-input (mA, mV, V, RTD, or Thermocouple), multi-functional, single-loop process controller (SLC) that provides control of analog process variables—such as temperature, pressure, or flow—in batch and continuous processes. 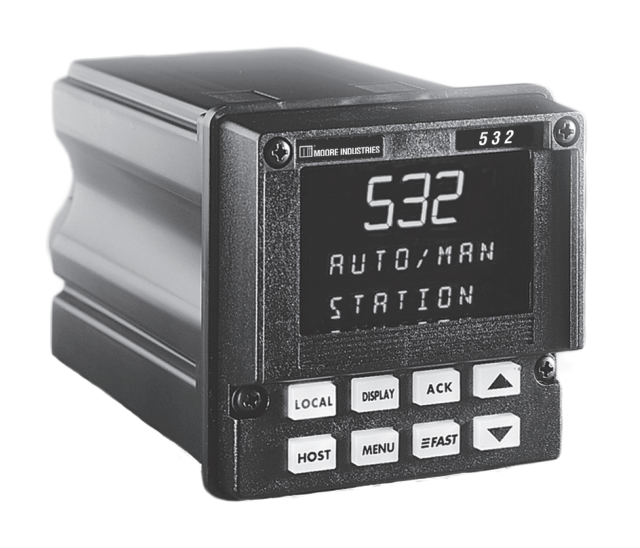 The Model 535 features rugged construction, a clear and intuitive interface, and effective tuning and control algorithms that enable it to control processes much quicker and accurately than other SLCs, PLCs, and PC-based control systems. For more information, see the Model 535 Single Loop PID Process Controller Datasheet launch and contact us to start your order. The Moore Industries Model 545 is a 1/4 DIN process controller that takes the place of two PID controllers due to its two independent, full-feature control loops. The Model 545 offers the same features as the Model 535 Process Controllers in addition to a selection of preproframmed compount loop control strategies. For more information, see the Model 545 Dual Loop PID Process Controller Datasheet launch and contact us to start your order. The Moore Industries Model 555 provides automatic, accurate control of chlorine in potable water and wastewater applications. It features flow pacing control, residual chlorine control, compound loop chlorine control, dechlorination control, and quick integration with flow transmitters and residual analyzers. For more information, see the Model 555 Chlorination/Dechlorination Process Controller Datasheet launch and contact us to start your order.